At the Region is an ongoing feature that discusses the state-by-state training, certification, and employment requirements of first responder departments across the nation. 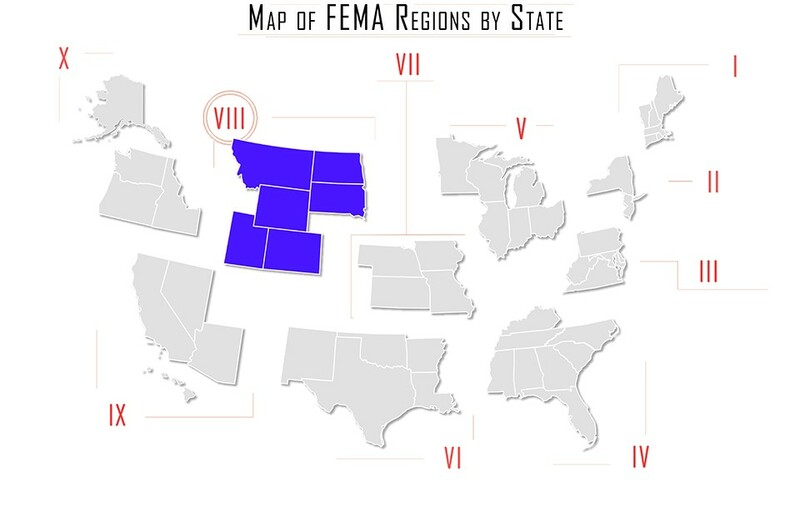 In this issue, At the Region looks at law enforcement requirements in Region VIII: Colorado, Montana, North Dakota, South Dakota, Utah, and Wyoming. The Colorado Peace Officer Standards and Training (POST) Board documents and manages the certification and training of all active peace officers and reserve peace officers working for Colorado law enforcement agencies. Colorado POST is a unit of the Criminal Justice Section of the Colorado Attorney General's Office. Prior to certification , all applicants must undergo a fingerprint/background investigation, pass physical and psychological exams, and attend a basic academy. The Board also requires that applicants hold a high school diploma or equivalent, and be first aid/CPR certified. In addition to meeting certification standards, hiring agencies generally have additional, such as an interview process, entry examination, and review of driving records. Applicants may attend a basic academy either post-hire through their department, or through an independent program. A full list of POST approved academies may be found here; programs listed as “Agency” require that attendees be hired by the hosting or other approved department prior to attendance. The current (July 1, 2017) POST Manual is available online. Applicant registration information is also available on the POST website, including the current training calendar. Certification remains active for three years after employment has ended, or indefinitely as a Reserve Officer. Renewal packets are available online. Once these requirements have been met, an officer who has been employed within six months of the application will be issued a provisional license, and will have six months to complete the written and skills testing. Applicants who have not been employed in law enforcement within the previous six months will need to pass the written examination prior to receiving the provisional license. After the provisional certification has been issued, officers who choose to use the Test-Out option will undergo a two-day POST examination involving firearms qualification, driving, arrest control, and a written examination. The fee to test out is $125 for each of the three skills. The written exam fee is $150, for a total of $525, and fees may be made by check or money order to POST. Applicants taking the refresher academy will attend a two- or three-week program at one of the approved training facilities, followed by a written examination. Once either of these options has been completed, an applicant will be issued a basic certification. The Public Safety Officer Standards and Training Council (POST) under the state Department of Justice sets training standards and issues certification/recertification for all public safety officers in Montana. Individual agencies may set requirements that exceed those of the POST Council (for example, State Troopers must meet additional corrected/uncorrected vision requirements and undergo a medical examination); however, many agencies use the standards as provided. Most agencies also administer a test to applicants, and recruits are selected from a pool of qualified candidates. Law Enforcement Officers must complete the appropriate basic course at the Montana Law Enforcement Academy within 1 year of hiring, or initial appointment.The Montana Law Enforcement Academy provides an intensive 12-week training course to all state, county, and city law enforcement officers; correction officers; detention officers; juvenile detention officers; motor carrier service officers; and public safety communicators. The Basic Academy is held three times a year; The 2017-2018 schedule is available here. • Demonstrated no break in service exceeding five years from the date of hire in Montana. Once POST has approved all training records, applicants must complete the Legal Equivalency Basic Course, offered through the MLEA, which consists of an orientation, classroom training, firearms qualifications, and a final exam. The course is offered three times per year, and contact/reservation information is available here. The Equivalency Course must be completed within the first year of appointment as a Montana peace officer. Applicants may apply for certification following their one year probationary period with a Montana department. • Pass a medical and psychiatric exam. Once an eligible applicant has been hired by a department, they will be issued a temporary “limited peace officer license,” which will allow the new hire to perform basic officer duties. In order to receive this license, the applicant must meet written and practical firearms qualification standards and submit a Peace Officer Application for License and fee to the POST Board. The hiring agency will also file a New Employment Peace Officer Form and License Eligibility Form to POST prior to the applicant’s first day of employment. To transition from a limited to full license, officers must complete the first available basic training session at the Law Enforcement Training Academy (LETA) in Bismarck. For enrollment information and housing (if required), contact LETA at (701) 328-9966, or email pdietz@nd.gov. A schedule of upcoming trainings may be found on the Academy website. Once the Academy has been completed, the officer must submit a fee of $25 to take the North Dakota Peace Officer Licensing Examination, and pass with a score of 70% or higher. The officer will then receive a license certificate and card. Officers must qualify annually with their firearm, and renew the license every three years by completing 60 hours of continuing education and submitting an application along with a $45 renewal fee. A new law allows for renewal of a Peace Officer's license up to one (1) year after expiration of the license. • Officers transferring to North Dakota may receive a partial waiver of Basic Training. The administrator of the hiring agency must submit a letter to the Board requesting a partial waiver of Basic Training. In order to be eligible for the waiver, the officer must be license eligible, currently licensed or certified as a full time peace officer in another state. • Any officer wishing to obtain a partial waiver of Basic Training MUST be hired by an agency and have been issued a limited license by the Board. • Pass the North Dakota Peace Officer Licensing Examination with a score of 70% or higher. Applicants who do not pass the Licensing Examination will be required to take the full basic training course at LETA. If the exam is successfully completed, applicants will receive a license card and certificate. • Take the oath of office before a judge of a court of record. Applicants who meet these standards and have been hired by a South Dakota department must become certified through Law Enforcement Training’s Basic Certification Course within their first year of employment. This 12 week course is hosted three to four times per year at the George S. Mickelson Criminal Justice Center in Pierre. The calendar of upcoming basic courses may be found here, and the application form is available on their website. Directions, an academy overview, and guidelines are also available. Officers who attend will be required to demonstrate proficiency in firearms, emergency vehicle operations, use of force, and defensive tactics. Reciprocal certification in South Dakota may be granted to officers who have received equivalent basic training in another state if the training was received within two years of application, or if the applicant has been continuously employed in law enforcement following the training. The Reciprocity Checklist includes all items to be submitted with the application. Officers whose training has been deemed equivalent must pass a written examination. After completing the exam, applicants must complete training and evaluation including domestic violence, criminal law, traffic law, and legal instruction, and a demonstration of firearm and emergency vehicle operation skills. • Demonstrate good moral character and be free from any mental or physical condition that would interfere with the performance of duties. Applicants meeting these requirements must complete a basic training in order to obtain certification. These trainings are offered through two programs: the POST academy, which is open only to recruits who have been hired by a department, and Satellite Academies, which primarily serve applicants who have not yet been hired (with the exception of the Fred House Academy, which is only open to corrections officers). In addition to employment with a law enforcement agency, the POST academy requires that applicants pass an Entrance The National Police Officer Selection Test(NPOST)Exam; the exams are held at several sites around the state, and dates, locations, and hours may be found here. The https://post.utah.gov/prospective-officers/basic-training-calendar/ program is conducted over the course of fifteen weeks, with five weeks of Special Function and ten weeks of Law Enforcement training. POST application instructions are available and additional requirements, such as physical fitness standards are available on their site. Applicants attending one of the eight Satellite Academies must pay for the program out of pocket; fees and entrance requirements vary based on the program. Classes are generally held in the evening and weekend hours, and follow a standard semester format. Students graduating from a Satellite program receive equivalent State certification status as a Utah Peace Officer. POST maintains a list of active employment opportunities. Reciprocity • Reciprocity is offered to peace officers certified in other states through a waiver exam. Those seeking waiver of training requirements will need to provide the curriculum and training hours of the basic training academy attended. • Contact POST at (801) 256-2300 after submitting the application. • Has an Employment Form submitted to the state by their agency of hire within fifteen days of appointment. Many hiring agencies and the pre-service academy also require that applicants complete the pre-employment written exam administered by Wyoming POST. The Entry Level Testing is conducted Fridays at 2:00 p.m. by appointment only. The cost is $35.00 payable only in cash. Call 307-777-7718 to schedule the exam. A list of state law enforcement agencies and their contact information may be found here. Once hired by a department, recruits are required to complete a Commission-approved basic training course within one year of appointment. Most agencies train through the Wyoming Law Enforcement Academy (WLEA), though independent department training facilities may also be certified. The Academy offers three Basic Courses each year, and training dates, applications, and physical fitness standards are available on their website (minimum fitness standards must be met prior to acceptance into the academy). The Basic Certification issued by the state is valid for two years, after which officers must recertify through an Advanced Certification; this requires 80 hours of additional Commission-approved training and a minimum of one full year of employment. Applicants may also complete the Wyoming Academy through the self-sponsored http://wleacademy.com/wp2/pre-service-program/ Pre-Service program prior to being hired by a department. A non-refundable application fee of $400.00 must accompany applications for Peace Officer, Detention Officer and Public Safety Communications Basic courses. Applications will not be processed until fees are received. Tuition and fees for Peace Officer Basic are $4,600.00. Applicants must meet all guidelines for law enforcement officers, and pass the Wyoming POST exam with a score of 70% or higher.Once the application and fee have been received, applicants undergo two day of testing, including a physical fitness exam, written and oral psychological evaluation, and written remedial test in basic math, English, and reading comprehension. Additional information and requirements are available in the Pre-Service Information Guide. To obtain further information or to receive an application on the Pre-Service Training Program, call 307.358.3617 and ask for Joyce Reiber our Pre-Service representative or e-mail her at joyce.reiber@wyo.gov to request more information via E-mail. • Possess a current CPR certification. Once an applicant has been hired by a Wyoming agency, the agency will submit an Employment Form to the Commission within 15 days of the appointment.